You really don't have to be young to find a friend in a teddy bear. Did you or do you still own a teddy bear? I remember I used to own a huggable teddy bear when I was a kid. It had a huge red ribbon wrapped around its neck. I believe I received it as a gift from my Nanay (mother). When I was a teenager, I received a few teddy bears from suitors and friends. I honestly don't know where these toys are. They're probably with another child as we have donated most of our toys. 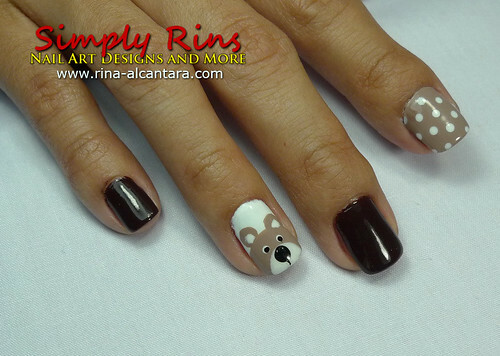 Teddy Bear nail design by Simply Rins! For my pointer finger, I used 2 coats of Orly Country Khaki. This is the only light brown I have and I think it's perfect for painting the bear on my ring finger as well. This polish is almost opaque with 1 coating. As for my ring finger and the polka dots, I wore 2 layers of OPI Alpine Show. Application is quite streaky but evens out with a top coat. For the other nails, I left them bare with Faceshop, a dark chocolate shade polish. I've been looking for a good chocolate shade and I think this is more than good! I found this during a recent visit to Faceshop. I got curious regarding the history of the name "Teddy Bear". So I sought the help of the ever reliable Google! It got its name from the late U.S. President Theodore Roosevelt, whose nickname was "Teddy". Why? In the early 1900s, President Roosevelt went to Mississippi to address the border dispute between Louisiana and Mississippi. During his visit, he went on a bear hunting trip. The people wanted to make sure that he will win a hunting prize so they caught a bear cub, tied it to a tree, and presented it to him. The president refused to shoot the bear and this story made the people love him more. Later, Morris Michtom, a New York toymaker, and his wife made a bear stuffed toy and asked President Theodore Roosevelt if they could name it Teddy Bear. September 09 is celebrated in the U.S. as National Teddy Bear Day! There really isn't any record on why this date was chosen. But the love received by Teddy Bears all over the world, by children and adults alike, makes it worthy to have a Teddy Bear Day! :) I know that September is far far away but I'm declaring today Teddy Bear nails day! Hooray! I hope you liked this Teddy Bear nail design. I also hope that somehow this nail art made your day better as you remember your childhood with your own Teddy Bear or as it still continues to touch your life right now. Awww this is so cute! <3 I love it! I love this design...I still have my first teddy bear...I really want to try a design like this soon! Very cute! I love the dotted accent nails and the bears turned out wonderfully. And I didn't know the history of the name- very interesting!